Until fairly recently, the biggest Russian motorcycle club Nochnye Volki, or the Night Wolves, were almost unknown in Europe. But that all changed last Spring when a group of affiliated bikers decided to ride to Berlin to mark 70 years since the end of World War Two. In just a few days, the Polish border guards denied them entry and then a German court invalidated their visas, rocketing the group to international notoriety. Backed by the Russian Foreign Ministry and some fellow-thinkers in Europe, the bikers split and some of them eventually made it to Berlin by May 9, the Russian Victory Day. 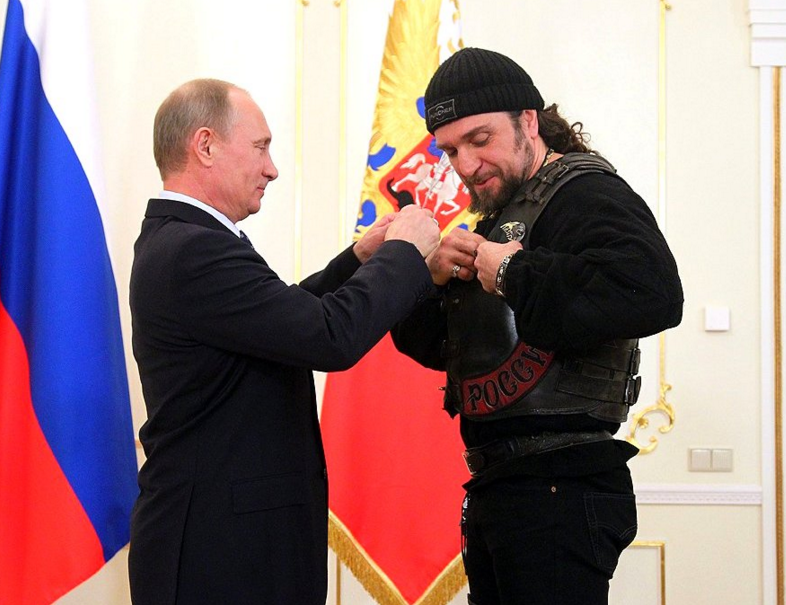 The Night Wolves are now feared as Russia’s largest and most notorious biker gang, fiercely loyal to Vladimir Putin, and say they are motivated by Christianity and patriotism. Anyone can apply to be in the Night Wolves, but you can’t if you’re addicted to drugs or a gay man (a bit of standard Russian homophobia there). Women also can’t join as it’s a ‘men’s club’. 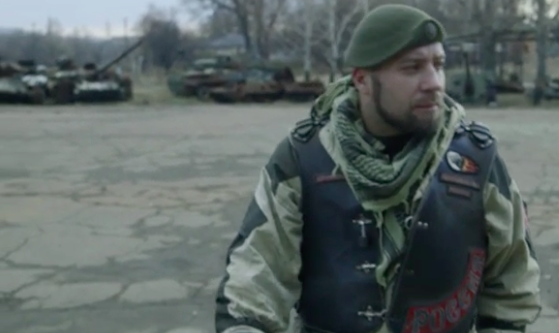 Their base in Luhansk, east Ukraine, resembles a bizarre set from Mad Max and some reporters from The Guardian recently met some of the gang’s members inside their stronghold. The ultranationalist group compare themselves to the military and are fixated on taking back land which they believe belongs to Mother Russia. Converted from a disused sports complex, the Night Wolves’ base is full of wrecked tanks, artillery shells and murals. During their time in the region, bar spending their time doing a lot of target practice with their weaponry, the men also grow vegetables and tend beehives. When they were formed in the 1980’s by Alexander Zaldostanov, they were created to fight against the USSR, but now work with the state. The group has exploded massively ever since, with thousands of members across Eastern Europe and close relations with Putin, leading to them being dubbed ‘Putin’s Angels’. Many of their members left family elsewhere to be part of the conflict in Russia’s covert invasion of Crimea, swapping leathers for body armour, and joining the Ukraine’s separatist insurgency. The Night Wolves were among the pro-Russian fighters as separatist tensions grew in the Donbass region in the spring of 2014, which claimed more than 9,000 lives. They had evolved from a tool for exerting soft power to something harder and more violent. Deputy commander Denis Kuznetsov spoke to The Guardian about how the annexation of Crimea handed them the perfect opportunity for Russia to reassert its strength. The USSR was the most powerful empire in the world. And in one hour, without a single shot, it was over. We lost everything we had for bubble gum and jeans. And McDonald’s. Since the early years in Moscow’s 1980’s underground, Kuznetsov and his fellow Night Wolves have evolved from a bunch of anarchic bikers into a key part of the Kremlin’s propaganda machine. But what about his aggressive actions in Crimea? Russia is not concerned here. Not once has Russia started war on her borders; Russia has never made war on another’s territory. We are always defending ourselves from enemies who want to take our land.